It's no exaggeration — dental implants have revolutionized teeth replacement. Life-like and durable, implants are the closest thing in design and function to a natural tooth. In fact, there's only one thing better than a dental implant — a real tooth. For function and long-term oral health, you can't beat what nature provided you in the first place. So before you finally decide to remove and replace that problem tooth, consider these other options for saving it. Root canal therapy. Tooth decay can do more than cause cavities — it can work its way into the pulp, the innermost layer of a tooth. If it isn't stopped here, it could continue on to the roots and put the tooth in real danger of loss. A root canal treatment removes the infection from the pulp and root canals and replaces the space with a filling. 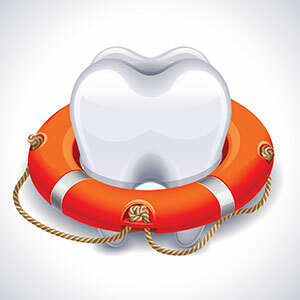 A life-like crown is then bonded or cemented to the tooth to protect it from further infection. Aggressive treatment for periodontal (gum) disease. This other dental disease is just as damaging as tooth decay. Caused by bacterial plaque, the gums around a tooth become infected and inflamed. As it moves deeper into the tissues and inflammation progresses, it can affect supporting bone causing it to dissolve. To prevent this potential bone loss, it's important to seek out and remove hidden pockets of plaque. This may require surgery to access the roots for plaque and calculus (tartar) removal, but it's well worth it to preserve the tooth. Bone grafting. As mentioned before, gum disease can ultimately lead to bone loss. But even when bone loss has occurred (a substantial threat to a tooth's survival) we may be able to reverse it with bone grafting techniques. During this procedure we insert grafting material at the loss site along with substances that stimulate growth. The graft serves as a scaffold for new bone cells to grow upon. Over time the bone volume increases and helps stabilize a weak tooth. Of course, your best option is to avoid dental disease in the first place with daily brushing and flossing and regular dental visits for cleanings and checkups. That and treating dental disease in its earliest stages will help ensure you'll have the best teeth possible — your own.